A hero to so many, and a legacy of strength and inspiration to Grossmont High School students, we're thankful and excited to launch the 2nd annual Ryan Wilcox Memorial Scholarship Fund. The funds raised will be managed by the Grossmont High School Educational Foundation. Our goal is to raise $2,000. It would be an amazing tribute to have members of our community come together and donate $20 (or $200? or the whole $2,000?) to help us meet this goal and honor Ryan's birthday. Reaching this goal will allow us to award at least two $1,000 scholarships this year. This scholarship will provide help for individuals who have overcome their own personal obstacles - financially, emotionally, or physically - yet have still kept a positive outlook throughout their challenges. They'll also have a love for Grossmont High School - the community and school spirit that Ryan so treasured. Last year, we had the honor to present The Ryan Wilcox Memorial Scholarship to 2 amazing GHS students. "Ryan showed incredible strength and courage through out his battle with cancer. His strong passion for life and his ability to smile in the face of adversity touched the hearts and changed the lives of so many. We are so proud and honored that Ryan's memory and sweet spirit will live on at Grossmont through these very special scholarships. To be able to give back, each year, to the community that meant so much to Ryan, means everything to us. We will never forget the amount of love Ryan received and the strength it gave him. Together, they inspired an entire community with a powerful message of strength, resilience, and love. 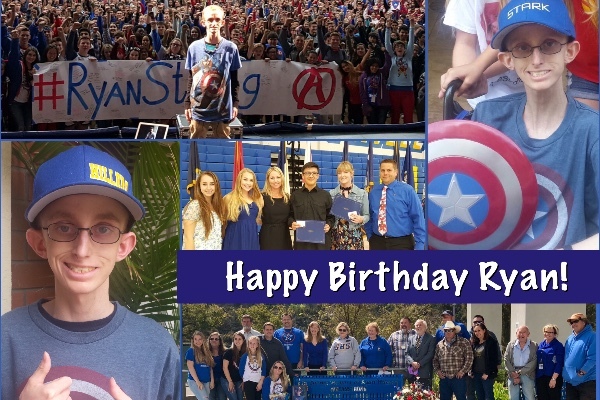 Ryan loved his Grossmont family and his positive attitude, his perseverance, kindness and his compassion for others truly embodies the true meaning of why "It’s great to be young and a Foothiller". ~With all our hearts, Thank you!